If you know me in real life, chances are you have heard me talk about Pinstripes. I have been absolutely raving about the place since I visited this summer! Pinstripes is the antithesis of the bowling alleys of years past. Featuring bowling, bocce, and a scratch restaurant (yes, you read that right - a bowling alley with A SCRATCH RESTAURANT!! ), Pinstripes has something for everyone. The large space has floor-to-ceiling windows that brighten up the space and one could spend an entire day there playing games. Although, the bowling and bocce areas are stunning, clean, and modern, the scratch kitchen is truly where Pinstripes shines. From the cocktails all the way to the dessert, there wasn't a thing I didn't love. 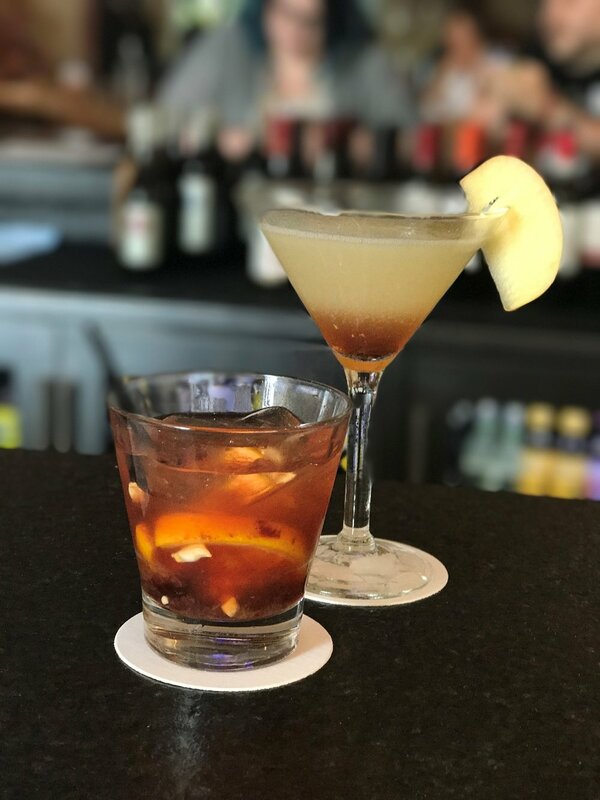 The signature cocktail is the Limoncello Martini (housemade limoncello, grand marnier, fresh lemon, citrus sour mix, and a lemon twist). If you are more of a bourbon drinker, the Manhattan is top notch. Featuring Breckenridge bourbon, amaro, bitters, Italian cherry juice, Italian cherry, and an orange twist garnish, this drink is a nod to the classic. The happy hour menu is one of the best I have seen in Kansas City. My favorites from the menu are the Tenderloin Sliders (these come with truffle potato strings, so it's a no-brainer) and the Barbeque Chicken Pizza. 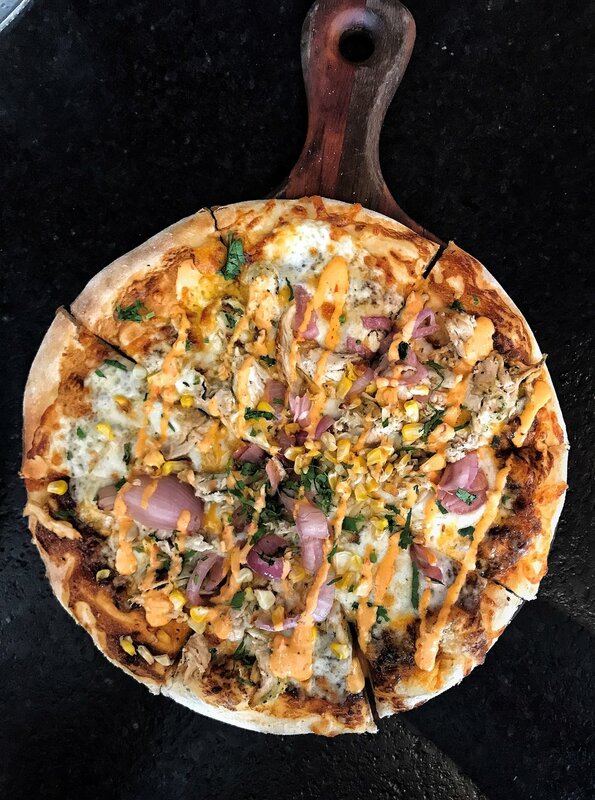 All of their pizzas are made with hand stretched dough and baked in their wood-burning pizza oven making you feel like you have taken a day trip to Italy. If you are planning on eating dinner there, you will not be disappointed! Order the Italian "Jambalaya" - spicy chicken, grilled shrimp, risotto, sausage and roasted peppers. If salmon is more your speed, the maple glazed salmon is out-of-this-world good. If you are anything like me, dessert is your favorite part of the meal. 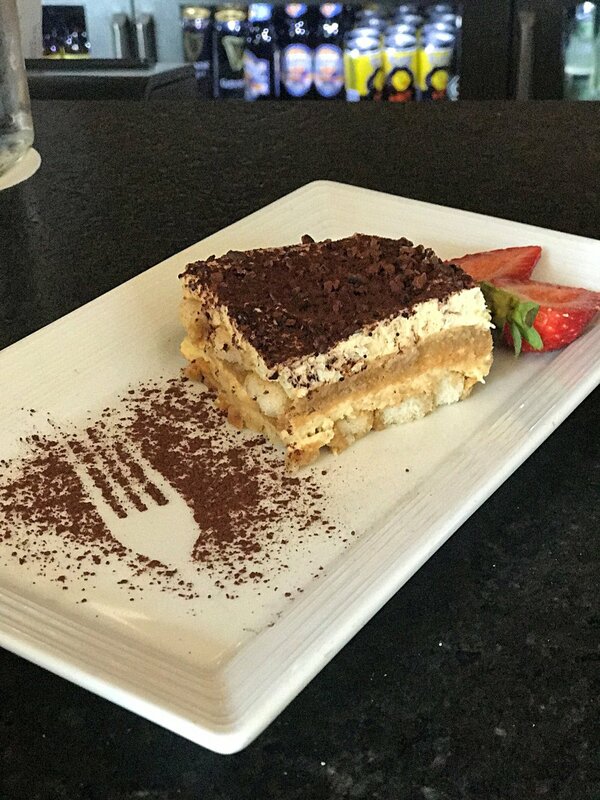 The perfect end to any meal at Pinstripes is their famous tiramisu - I still have dreams about the slice below. Truly the only mistake you can make at Pinstripes is not going! Now that you all know how many things I ate in one sitting, it's time to go on a run (or time to make another reservation at Pinstripes…. ).